For anyone wanting to get in shape or stay in shape, the MIO Motiva line of strapless heart rate watches offers a simple, comfortable way to track one’s heart rate and calories burnt. One of the most difficult parts of staying healthy is accurately calculating your heartbeat and the number of calories you’ve burned during a workout. There are many heart rate monitor watches on the market that are designed to monitor your heart rate and calculate calories burned for you. So many, in fact, that I found choosing the right to be overwhelming. Often, these watches are expensive and rely on an uncomfortable chest strap for an accurate reading. The MIO Motiva line of watches offer the same accuracy without the chest strap. I was able to enter my personal information, such as my age and weight, as well as my weight loss goals. The watch then automatically calculated my target daily calories to help reach my goal. I am able to measure my heart rate recovery time, giving me a good indication of my overall heart health, and it features a 3500-calorie countdown, so I know how close I am to losing another pound. Additionally, the watch functions as a timer, with 5 different timer modes. The price is listed as $89.99, about average for a watch of this type, although they can often cost as much as $150 or more. The Petite Pink model is smaller and came with two interchangeable straps, one light pink, the other white pink and black, making it perfect for women who want a watch that is less bulky. 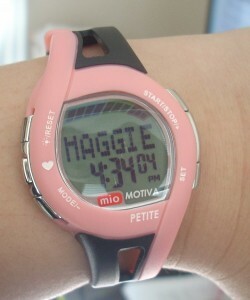 It is water resistant up to 30 meters, features an alarm, and a luminescent backlight. Because there is no chest strap, I did have to manually test my heart rate at regular intervals, whereas a watch with the strap constantly monitors heart rate, so the slight discomfort of the heart rate strap may be worth it for someone who engages in more intense workouts. Also, while the watch does calculate calories burned, to get an accurate reading of calories in versus calories out, you still must manually enter the number of calories you eat at every meal, which can be time consuming. The MIO Motiva line was featured on Dr. Phil’s Ultimate Weight Loss Challenge. The package includes “A Guide to Healthy Living,” with an introduction by Deepak Chopra, M.D. Uses personal information to calculate healthy goals. Measures heart rate recovery time. Count down to zero and stop. Count down to zero, then count up (warm up timer). Count down to zero and repeat. Must manually check heart rate at regular intervals. Must manually enter in calories consumed. The MIO Motiva Petite Pink Strapless Heart Rate Watch is a perfect heart rate monitor watch for anyone looking to get in shape or stay in shape. It requires a little more effort than heart monitors with chest straps, but is definitely worth the price for all the features it boasts.